Those who are under thirty today in the countries of the former Soviet Union can barely remember what it felt like to live there. They never knew it. Many of those over thirty have also chosen to forget. They might remember familiar details, but their more recent experience has obliterated the feelings that went with them. Antanas Sutkus’s photographs at Pushkin House, the earliest dating back to 1959, bring it all flooding back. The pictures are monochrome, the clothes people are wearing in them are old-fashioned, the style of photography is probably not one that would be used today, and yet it is not the general look of these pictures that makes this still recent era immediately recognizable, but the eye of the photographer, who has something important to tell us. What he is telling us, with all the clarity and precision of black-and -white photography, is that although he lives in the Soviet Union he does not conform to its oppressive regime. He is not protesting openly – not exposing its most ugly sides, not poking fun at the authorities, - but his photos of the ordinary people who are his neighbours - children, students, villagers – the people he loves and feels sorry for, are a conscious repudiation of official Soviet norms. Soviet photographs invariably portrayed people, whether famous figures or just ordinary citizens, as part of the great socialist motherland. Even when the motherland was not explicitly indicated by a Kremlin star or a building site, factory or monument, it was always a powerful presence, which sometimes - especially during the “thaw” of the 60s – would accept endearing human foibles such as running barefoot in the rain - but would always be bigger than any of its citizens. 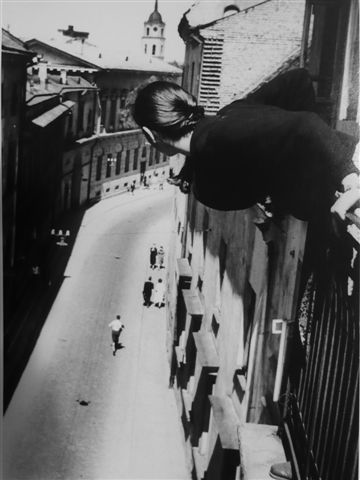 Sutkus’s photos, with their soft interplay of light and dark surfaces reminiscent of Italian neorealist films of the 1950s-60s, dare to make people more significant than the state. And this is something that in itself transforms merely non-Soviet pictures into anti-Soviet ones. With ”Blind Pioneer” (1966) it is different. Here there is obvious Soviet symbolism, but it is so inappropriate that the portrait seems to exude dark ambiguity. 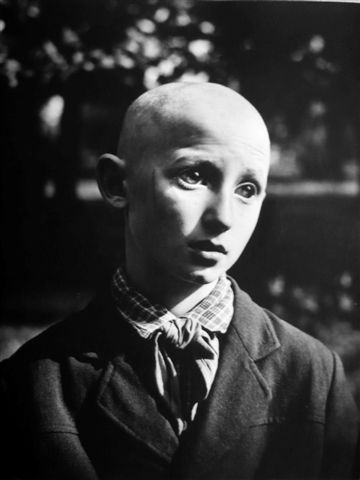 Why is this meek shaven-headed blind boy a Young Pioneer? What is going on in the heart of a child who must have been blind from birth? Does the fact of belonging to the children’s communist organisation overshadow his personal tragedy, his private grief? The emphasis on the private in Sutkus’s pictures is a protest against the ubiquitous interference of the state. The little girl pressing her cheek against her mother’s hand (“Mother’s Hand”1966) is not yet aware of this dichotomy – her gesture is spontaneous and genuine - but the photographer is. The young Bulgarians in “Miss Bingos” (from the series “Meeting with Bulgaria” (1973)) look free - socialist Bulgaria, even if not a proper ‘abroad’, was still for Soviet citizens a foreign country, where the climate allowed girls to be unselfconsciously half-naked and men to feel easy in their presence…At home, however, there are no men in “The Morning after the Wedding” (1982), just women loaded with bags and parcels waiting at the bus-stop, women who always have to bear the brunt of everyday hardships. The silent non-acceptance of the Soviet regime that could be found everywhere in the Soviet Union was nowhere stronger than in the Baltic republics, which were forcefully incorporated in it in 1940. This was the year in which Sutkus’s father publicly committed suicide when asked by the Soviet occupiers to deliver a speech at the celebrations of the October revolution,. Brought up by his grandparents, Antanas Sutkus must have been aware from very early on of a secret life existing under the occupation. Not necessarily the life of partisans or dissidents, but the life of ordinary people, who tried to distance themselves from the Soviet system as much as possible. ’Whether under the Soviet regime or under the Nazis [who occupied Lithuania between 1941 and 1945] , life has its own flow‘, Sutkus once remarked, and it was this independent flow that he recorded in his photos. And then everything changed. When the Soviet Union started collapsing Sutkus took probably one of his happiest and funniest pictures. In “Good-bye, Party-Comrades!” (1991) a statue of Lenin with his outstretched arm is floating in the air, dangling from a crane, but his boots are still firmly set on the plinth… And yet for Sutkus the changes that happened to his country meant among other things a farewell to photography, or at least a farewell to photographing people. Since then he has had many personal exhibitions all over the world, displaying previously unseen photos whose negatives had been carefully preserved in his huge archive; he has been active in the Lithuanian Union of Photographers and received prestigious awards; he has travelled the world and been involved in numerous projects, but he has not been taking photos of “people of Lithuania”, as he once called one of his series. So what happened? In an 1996 interview Sutkus says: ’During the Soviet administration, we were oppressed but we were the owners of our souls. And the Lithuanian spirit only became more vigorous. The harder the oppression was, the stronger we became. But since the iron curtain was opened, we have been confronted with all the devils of materialism… I don’t photograph people anymore. I also find it very difficult nowadays to find someone who is spiritually compatible‘. And he explains: ’Capitalism is not so good as we had expected it to be and materialism is introducing a lot of bad things that we never knew before. Lithuania has her own culture. We don’t need the pop culture from America or Western Europe. But every small country has the same problem of being invaded by American pop culture. Even big countries, such as France, have to face up to the situation. Material life is what our young people have been after since childhood. The spiritual things are nowhere to be found‘. This explanation is simple, familiar and yet not necessarily correct. Was it the influx of material goods that corrupted the Lithuanian spirit, or was it the sudden loss of the silent alliance of those who resisted the powerful enemy, Soviet rule? Just after the fall of the Berlin Wall one still could feel in Eastern Europe its almost invisible manifestations – like people’s breath in frosty weather. A writer, a theatre director, a photographer would know exactly who they were working for – the people who shared their values, often both political and artistic. Then the silence was broken and the alliance fell apart. The “spiritual things” were no longer the common possession of different people, no longer shared in secret, while “material things”, on the contrary, became common to nearly everybody, as material survival in the new era brought stresses and strains that had been unknown before. 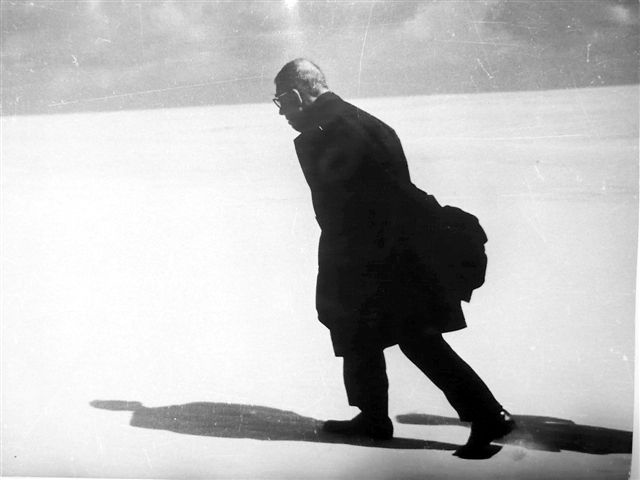 Antanas Sutkus has remained a photographer of the Soviet era. But this year he was commissioned to take part in the exhibition “World in London” that celebrated the diversity of the British capital. 204 photographers - both celebrities and beginners - were invited to take photos of Londoners who represented the 204 nations taking part in the Olympic Games. Sutkus photographed not a Lithuanian, but a young man from Montenegro, Nicola Pejovich, who has lived in London since 1992 and owns a small restaurant here. In the short video accompanying the exhibition the young man appears and sounds upbeat, but in Sutkus’s monochrome photo he stands tensely in a tight leather jacket at the side of a long tree-lined path in a London park and looks like a fighter, although not necessarily a winner, in life’s battles. The master of Lithuanian photography has lost none of his skill, and could be making portraits of people today as profound as those of twenty years ago. Only he is no longer interested.